Groomsoft Maps has some great features for the mobile groomer that will save you time and money. Stop driving back and forth across town. 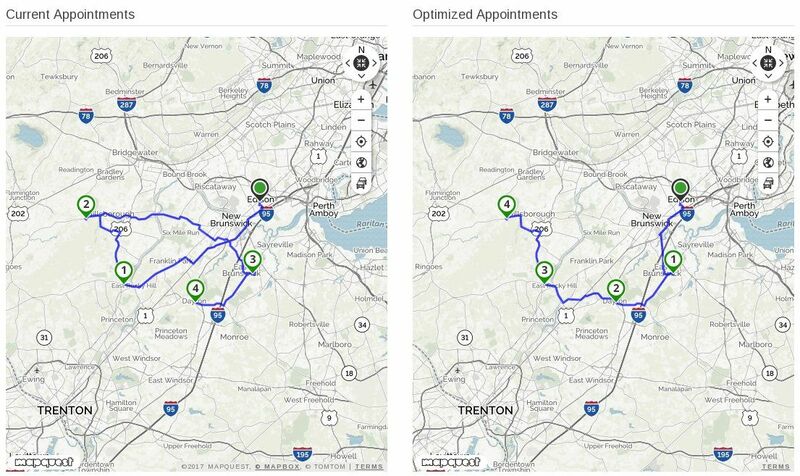 Let Groomsoft optimize your appointment driving route to save time, gas and money. A customer calls in wanting an appointment, but you have no idea when you will be in their area. With Groomsoft you can see exactly when and how many miles you will be from that customer. A customer cancels at the last minute, but you need to get one more groom in today. Groomsoft will show you who is past due for a groom and how many miles they are from your current appointments. Automatic mileage tracking will save you time by logging the mileage for all of your appointments and return trip. Great reports for tax time. Not only is the map large, but you can control it with zoom features, see traffic, satellite view and locate your position on the map. Manage all of your customer, pet and appointment details directly from the Maps page. Demo it for 30 days FREE - No credit card needed! When you optimize your appointment route with Groomsoft, a new map of appointments will be shown with the stops routed in an optimized order to save time and money. An optimized appointment list will also appear below the map, showing you the order that the appointments should be in. This can be used on your existing appointments if you would like to reorder them or even better for creating new appointments. After adding a new or existing customer to the map, click optimize route, select your options and click the Optimize Route button. You will be able to see what time the new appointment should be by looking at where the stop ends up in your route on the map and in the optimized appointment list that appears below the map. Optimize your appointment route the way you want. The route type can by either shortest time or shortest distance. The first stop option let's you choose if you want your first stop to be the closet or farthest appointment. On laptops or desktops, the optimized route map will appear next to the original appointment map for side to side viewing. On mobile devices, the optimized map will appear below the original appointment map. The numbered stops on the map can be clicked on to show some appointment details, including the stop number, customer name, address and pet names. In the Maps pictured below, optimized route saved 37% in Mileage and 50% in Time! This list will show your current days appointments in an optimized order. Clicking the "Show when I'm Close" button will show you a list of upcoming appointments and how far they are from a new or existing customer's address. This is great when scheduling new appointments. It helps you pick a day where you will be in the customer's area. Fill up your calendar - when you have a slow day or someone cancels on you, Groomsoft will show you who is due for a groom and how far away they are from the current days appointments. If you already have appointments for the current day, you will see how far you are away from those appointments. If you have no appointments, you will see how far away you are from your business address. This list has clickable phone numbers and links that will launch either your phone's dialer or email client for you. Groomsoft will log all the miles for your appointments that have not been set to Canceled. You can add, edit or delete any mileage from the log. Mileage report can be viewed for this year, last year or any time period. Grooming trucks report will list all the details of the trucks your have entered in Groomsoft. Grooming Truck Assignments will show who drove what truck when. This is great for accountability if you have multiple trucks/groomers. All reports are printable and downloadable as a CSV file. A huge map that helps you visualize your grooming appointments for the day. Satellite view - so you can see the details of the road and more importantly, parking! Locator - if supported by your browser, you can see where you are in the map. 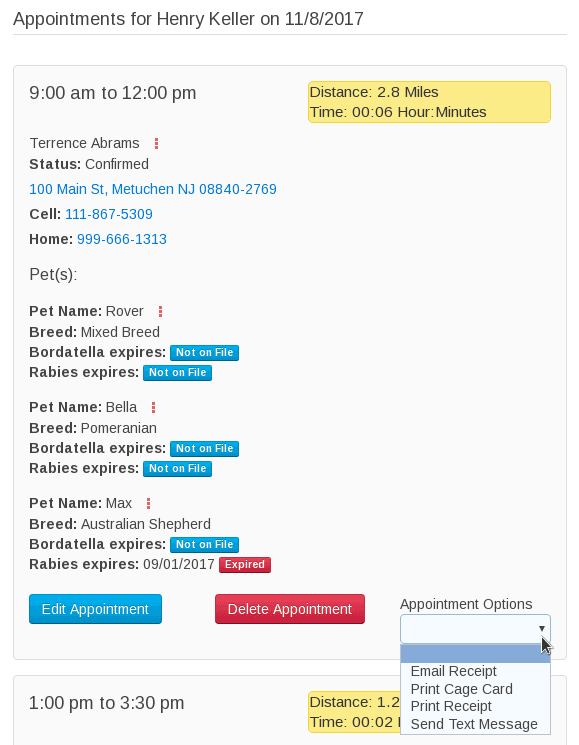 Appointment List - Manage all your customers, pets and their appointments from the Maps page. Below the map showing your appointments of the day will be the appointment list. Customer and Pet Names along with pop-up menus with options to edit the customer/pet and the customer/pet tags. Text Message indicator if previous messages have been sent/received with this customer. The address and phone numbers are clickable, so that you can launch your mobile device's phone dialer or navigation app. Pet information displayed, includes the breed and vaccination information.